SIXERS-CELTS A MARQUEE OPENING NIGHTER ON TNT! 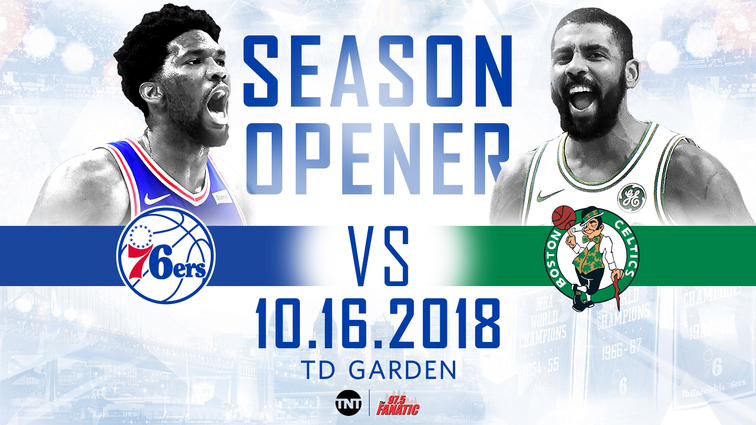 And the Sixers will be playing on all three, with their Tuesday, October 16th game against arch rival and post-season ouster Boston marking the league’s first regular season game of the year. According to Turner Sports records, you’d have to go all the way back to 2003 to find the last time the Sixers were featured as part of the Opening Night NBA on TNT telecast. Two days later, the Sixers will be on TNT once again, for their Thursday, October 18th home opener against the Chicago Bulls. As for this year’s appearance on Christmas, the Sixers will be battling Boston in a matinee at TD Garden on ABC. After going 16 seasons without playing on the holiday, the Sixers have now been tapped for the league’s premiere in-season showcase for a second year in a row, and 31st time overall. On Martin Luther King Jr. Day, which falls on January 21st, the Sixers will welcome the reigning Western Conference regular season champion Houston Rockets. TNT will have the broadcast. The rest of the Sixers’ 2018-2019 slate should be released in the coming days. Hosting a Chicago Bulls team that had an active summer, the Sixers will aim to use their first regular season outing at The Center as a means of setting the tone on their home turf. The Sixers’ performance in South Philadelphia a season ago was critical to their success. The team went 30-10 in games at The Center, which was good for the second-best home record in the East. In addition to bringing back a young core consisting of Kris Dunn, Zach LaVine, and Lauri Markkanen, Chicago drafted Duke big man Wendell Carter Jr. seventh overall. The Bulls also inked hometown product Jabari Parker, the 2014 no. 2 pick, via free agency. Noteworthy about this particular pairing, however, is that it will come on the final day of what Brett Brown traditionally dubs the “first-third” of the season. The timing of this game could give us a better sense of how the Sixers and Boston stack up head-to-head compared to Opening Night, when both teams will still be getting their feet wet. Two of the NBA’s top-five regular season teams, the Sixers and Rockets played each other close last year. They first met at The Center in late October, then, less than a week later, squared off at Toyota Center. Houston escaped the first tilt with a 105-104 victory, while the Sixers took the re-match, 115-107. The loss was one of only seven at home in the regular season for the Rockets, which went on to establish a new team record with 65 victories. Previous SIXERS TOP 2015 PICK JAHLIL OKAFOR SIGNING WITH PELICANS! Next UNION MAKE U. S. OPEN FINAL WITH STUNNING 3-0 WIN OVER FIRE!